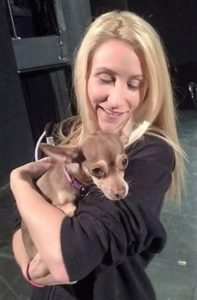 Theatre Three in Port Jefferson is gearing up for its next Mainstage production, “Legally Blonde: The Musical,” which will open on Saturday, Sept. 17. 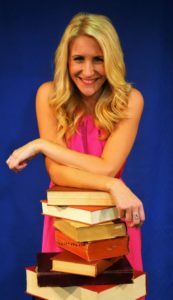 The role of Elle Woods will be played by 28-year-old Brittany Lacey, best known to Theatre Three regulars as Mimi in “Rent” and as Belle in “A Christmas Carol” when she was a company member there from 2010 to 2012. 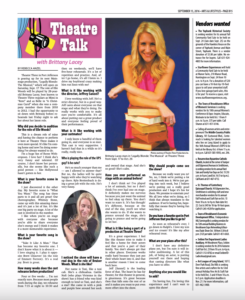 I had the opportunity to sit down with Brittany before rehearsals last Friday night to ask her about her latest role. Why did you decide to audition for the role of Elle Woods? This is a dream role of mine and having the chance to perform it here at Theatre Three makes it even more special. It’s like I’m coming home and now I’m doing something I’ve always wanted to do. I’m a huge fan of Reese Witherspoon. I love her! I think she’s very funny and talented. Of course, I don’t know her personally, but she seems like such a good person — like Hollywood hasn’t gotten to her. What is your favorite scene in the show? I just discovered it the other day. My favorite scene is “What You Want.” The song has three parts to it and all are great! Our choreographer, Whitney Stone, came up with this amazing dance and it’s just a lot of fun. It’s like one big party on stage. A lot of the cast is involved in the number. I like when you’re on stage with everyone else because you’re able to share everyone else’s energy and I think it makes it a more memorable experience. Brittany Lacey stars in ‘Legally Blonde: The Musical’ at Theatre Three from Sept. 17 to Oct. 29. Photo by Peter Lanscombe, Theatre Three Productions, Inc.
“Take It Like A Man.” That has become my favorite one. I don’t know what it is about it — I love singing it. I play it opposite Brett Chizever (in the role of Emmett Forrest). It’s a real joy. Brett is great. How many weeks does the cast rehearse before production? Four or five weeks … I’m not exactly sure. Because most people work during the day, we rehearse from 7:15 at night to 10:30 and then on weekends, we’ll have five-hour rehearsals. It’s a lot of repetition and practice. And, after I go home, it’s all I listen to. I drive my boyfriend crazy making him run lines with me! What is it like working with the director, Jeffrey Sanzel? I love working with Jeff. He’s a strict director, but in a good way. Jeff cares about everyone on that stage and what they’re doing. He really works with you to make sure you’re comfortable. It’s all about putting out a great product and everyone feeling proud of their performance. What is it like working with your castmates? I only knew a handful of them going in, and everyone is so nice. This cast is very supportive. I haven’t had that in a while so it’s really, really nice. Who is playing the role of the UPS guy? Is he cute? He’s so much younger than me — am I allowed to answer that? But no, the ladies will be quite happy with who they’re watching up there. Kyle Breitenbach is doing a great job with the role. He’s very funny. I noticed the show will have a real dog in the role of Bruiser Woods. What is she like? Her name is Taxi, like a taxi cab. She’s a chihuahua. Caitlin Nofi (who plays Vivienne in the show) has a friend who was kind enough to lend us Taxi, and she’s a star! She came in with a pink and purple bow around her neck and owned that stage. And she’s so good! She’s calm. Have you ever performed on stage with an animal before? I don’t think so! I’ve played a lot of animals, but no I don’t think I’ve ever had one on stage. It definitely makes me nervous because you just want the animal to feel okay up there. You don’t want to scare it. It’s fun though! It’s different, because at the end of the day, you’ll see what she wants to do. If she wants to prance around the stage, she’s going to prance and we’re going to let her. Brittany Lacey with the only four-legged member of the show, Taxi. Photo courtesy of Theatre Three. What is it like being a part of a production at Theatre Three? It’s a great experience. I feel like this theater tries to make it feel like a home for their actors and that you’re a part of their family. You don’t always get that in other places. Everyone works really hard because they just put their whole heart into it, and that is another reason I love to come back here. Jeff [Sanzel] is the leading force of that. The heart he has for theater, for this theater in general, is ginormous. It’s great because then that falls onto the rest of us and it makes you want to put even more effort into the show. Because we really want you to! No, no, I think we’re putting a lot of hard work into it. We’re just getting into tech week, but I believe we’re putting out a really good production and I hope it’s fun for them. We promise to entertain you! We all love what we’re doing, so I think that always translates to the audience. If we’re having fun, hopefully that means they’re having fun watching it. Do you have a favorite spot in Port Jefferson that you like to go to? As soon as rehearsal’s over, I go down to Ralph’s. I love my ices and ice cream! It’s like my after rehearsal treat. I don’t have any definitive plans yet, but I’m sure it will involve auditioning. A lot of this job, of being an actor, is putting yourself out there and hoping that casting directors like what you have to offer. I’m having fun, I’m loving this experience and I can’t wait to open this show! Theatre Three, 412 Main St., Port Jefferson will present “Legally Blonde: The Musical” from Sept. 17 to Oct. 29. Tickets range from $20 to $35. For more information, call 631-928-9100 or visit www.theatrethree.com. 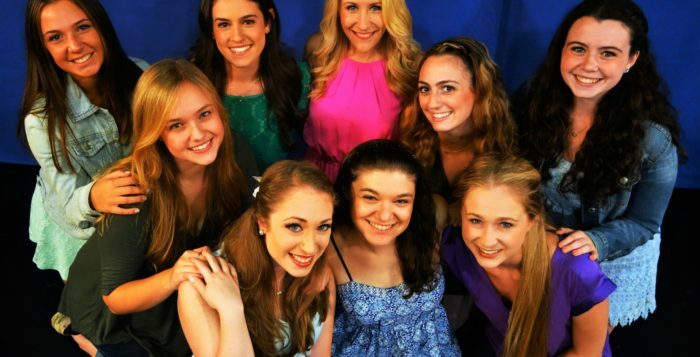 The Sisters of Delta Nu in Theatre Three’s production of ‘Legally Blonde: The Musical’ at Theatre Three. Photo by Peter Lanscombe, Theatre Three Productions, Inc.